The Clintons and the Trumps are old friends. AFRICANGLOBE – The Alfred E. Smith dinner is supposed to put a bipartisan bow on the gift of American democracy. 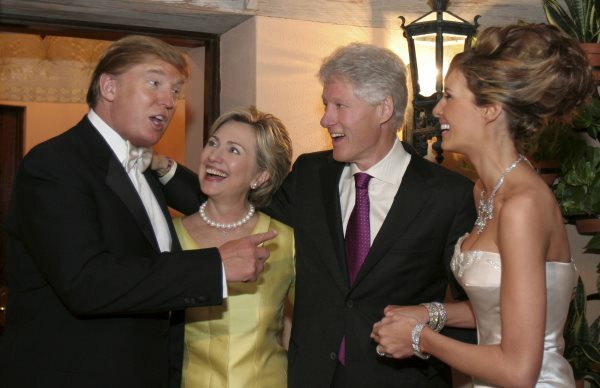 For decades, the well-heeled and well-connected have come together to laugh at and with the chosen presidential candidates from the two wings of the governing duopoly. It’s meant to be a reminder that they are all in the same boat and that politics stop at the water’s edge. It supposed to be a reassuring reminder that the system works. It’s supposed to be all in good fun. But this year’s dinner turned ugly. Donald Trump was resoundingly booed for predictably not knowing the difference between his overwrought, histrionic campaign and self-effacing bipartisan banter. Hillary Clinton jabbed back with sharply written jokes before kibitzing with a bevy of power elites (Hello, Kissinger!) as they slowly left the dais after taking turns posing with the Establishment’s cardboard cutout. Frankly, it was exactly the sort of “dinner theater of the absurd” we’ve come to expect after sixteen months of petulant name-calling, hacked emails, carnival-like debates, and the media’s profitable collusion with both candidates. More than ever before, the duopoly is asking voters to render judgment on comically-flawed contestants in what’s little more than an overly-produced talent competition between two intolerably bad performers. It’s American democracy as The Gong Show. This ever more divorced from reality show looks like the grand finale of a political system that’s finally discarded any lingering pretense of policy proposals, budgetary priorities, and functional governance. Now it’s all come down to a simplistic, binary choice between a bombastic, narcissistic villain and a cold, calculating scoundrel. It’s a choice between doom and not doom. It’s us versus them. And that’s because the Two-Party System™ has finally jumped the shark. “Jumping the Shark” comes from an infamous episode of Happy Days when, in the midst of its 11-year run, the show’s brain trust concocted a gimmicky, three-part cliffhanger storyline featuring the Fonz literally jumping over a shark during the climactic scene of the opening episode of the fifth season. Since then, “Jumping the Shark” has become shorthand for pointing out the looming bankruptcy of an idea and the last ditch effort to save it with a bizarre, unbelievable, and comically excessive plot device. Can you say “2016 Presidential campaign”? Like the Fonz in a leather jacket on water skis jumping over a dangerous shark, this grotesque campaign looks more and more like one big gimmicky stunt to drum up ratings for a tired, predictable premise. In this year’s political episode it’s Uncle Sam being whisked around behind the boat wearing an ill-fitting life preserver. The music swells as he gets closer to the ramp. The camera cuts away to the spin room to show us contorted reaction shots on the hammy faces of a familiar cast of campaign surrogates … just to make sure we remember to feel all that manufactured tension. The press gaggle swims around in the muddied waters they’ve incessantly chummed with the fetid leftovers from nearly thirty years of the candidates’ personal and professional peccadilloes. Then — as if on cue — this melodrama is perfectly set up when America’s first Celebritician rewrites the script of Election Day into an actual cliffhanger! Trump’s unsurprising recalcitrance in the face of looming defeat was even punctuated with “I’ll keep you in suspense.” It’s like he’s actually directing a bizarre reboot of that infamous Happy Days three-parter! Now, all the audience can hope for is that Uncle Sam is successful and representative democracy lands safely on the other side. Off screen, the Two-Party producers nervously hope their show will be renewed for another season. And frankly, that’s exactly what’s at stake. For the first time since the end of World War II, cancellation seems like a real possibility. That’s because this election is exposing the extent to which America’s Two-Party System™ — like a long-running, woefully worn-out sitcom — has simply run out of ideas. There are no new ideas to free-up a post-Crash economy now “trapped” in a state of suspended animation by $3.5 trillion worth of Federal Reserve funny-money. The so-called “fundamentals” of this highly-financialized global system are built on mountains of debt, on stock prices artificially pumped-up by quantitative easing, and on the systematic buying-off of criminal charges to ease anxious investors’ minds. This is all set against the backdrop of an increasingly disrupted jobs market teetering on the precipice of a radical reorganization at the synthetic hands of artificial intelligence. There are no new ideas for pulling the neo-imperial thorn out of the side of the Middle East or for de-escalating a now truly global War On Terror that’s dislocating record numbers of people as it quickly approaches the two-decade mark. Instead, America is “pivoting” like a bloated bull into China’s neighborhood shop while also putting the finishing touches on the post-Cold War encirclement of Russia. The default to a dangerous reboot of the Cold War shows how completely bereft the Beltway is of imagination or insight. Obviously, the bipartisan foreign policy establishment — like lipstick-wearing pigs greased-up with defense industry largesse — simply cannot ponder a world in which the national security trough isn’t brimming with taxpayer-funded suet. If nothing else, this campaign reaffirmed the sacrosanctity of the defense budget. Most distressingly of all, there are no new ideas for ending the costly war America has waged on itself — the War on Drugs. Instead of finding ways to stop arresting drug users at a staggering clip of 1 person every 25 seconds, loud shouts of “law and order” ring out at ominous political rallies while the crisis of American policing grinds the wheels of justice into the fertile soil of social unrest. Meanwhile, the national heroin freakout is being assembled by politicians and the media into a towering wicker man stand-in for the perfectly legal narco-traffickers of Big Pharma. If it all goes according to the usual script, the heroin scapegoat will be unceremoniously burned in the bonfire of our political inanity while human history’s most powerful drug gang keeps sending their profiteering protection racketeers to Capitol Hill. At the same time, an increasingly extra-constitutional drug war will churn on like a dystopian Black Male Removal System concocted by a science fiction-writing Klansman. This political season’s modulations, bloviations, and triangulations do nothing to address these long-festering issues. Then again, the Two-Party System™ has been tuning out issues, turning on each other, and dropping out of reality for a long time. But now it’s completely lost the plot devices that held their captive audiences, often in spite of their own self-interest. It’s even largely stopped fighting the old culture wars over abortion rights and wrongs, creeping godlessness, and those all-too-telling fears of apocalyptic gayness. The ratings are in and those sideshows have been canceled, particularly since they don’t really appeal to the key 18 –34-year-old demographic. Let’s face it, the ratings have been sliding for a long time. Back in January of 2016 — right on the eve of this season’s premiere in Iowa — Gallup found party affiliation was near an all-time low with 29% of American adults identifying as Democrats, 26% as Republicans, and a robust 42% identifying as independents. As the year entered the crucial Fall schedule, Democrats edged up to 32% and Republicans added a point to 27%, but “independent” is still the winner with at least 40% of Americans rejecting the two parties for the fifth consecutive year. In fact, a New York Times analysis broke down the numbers. They found a mere “14 percent of eligible adults — 9 percent of the whole nation — voted for either Mr. Trump or Mrs. Clinton” during the primaries. In other words, the two main roles in this political psychodrama were cast by just 9% of Americans. Forget the 1%. Consider the power of the 9% and how the duopoly is fundamentally based on misrepresentative democracy. The growing detachment from the Two-Party System™ is also reflected in the epically low approval rating for Congress, which is currently at 17% after a decade-long slide from the artificial high of 84% it reached immediately after 9/11. Sadly, that era of triumphal bipartisanship produced the Patriot Act, the surveillance state, and this young century’s most egregious international crime — the wanton destruction of Iraq under false pretenses. But if that’s the best idea the governing duopoly can produce, perhaps it’s a good thing the Two-Party System™ has nothing to say about CRISPR or the brave new world of genetic engineering. Nothing to say about 3-D printing and the coming revolution in manufacturing. Nothing to say about a rapidly accelerating Sixth Great Extinction that will radically alter ecosystems around the world. Nothing to say about antibiotic resistant superbugs, about migrating and evolving diseases like Zika, or about the coming scarcity of potable water and shift in arable land as anthropogenic climate change alters landscapes and pushes populations to flee low-lying delta zones like Bangladesh. Maybe the future of politics — if there is a future for politics — is not the black and white binary system of the governing duopoly, but rather, the Venn Diagram. Perhaps if the parties splinter, actual governing can happen when coalitions are built where their issues overlap. For example, Libertarian-leaners and Green-leaners agree on empire, the drug war, the Federal Reserve, crony capitalism, government surveillance, and civil liberties. Even some of the freer thinkers inside the ruling duopoly have agreements on one or more of these issues. But nothing happens. That’s because it cannot happen so long as the entire political system is merely an expression of the duopoly’s desire to get picked up for another season. That means their “stars” cannot run on issues where issues intersect with the competition because that undermines their sole rationale for being elected — which is now simply based on being oppositional. The only real reason to vote for us is to stop them. As such, the only real choice is between personas who are little more than human brand identities that somehow express “who we are as a party” instead of what we want to get done as a society. The simple fact is the Two-Party System™ simply cannot cope with the complex, issue-based reality of America and the world in the 21st Century. It’s old programming that worked when the world was over-simplified by the Cold War into Democracy versus Communism, Freedom versus Totalitarianism, and the Self-Appointed Good versus the Evil Empire. Maybe that’s why the duopoly seems so hot for a new Cold War. The only way their binary system works is if there is a common enemy to turn into America’s common denominator. And maybe that’s why the Al Smith Dinner is no longer a jovial reminder of the grand bipartisan bargain. Like Happy Days, it is a trite, nostalgic reflection of a time long since passed — except without the laugh-track.